Our last post focused on our experience in concept testing and how it applies to our high shear mixer sample testing process. This post will dig in a little deeper and provide insight into the breadth of data we provide to our customers when they commission Lancaster Products to provide sample testing for them. 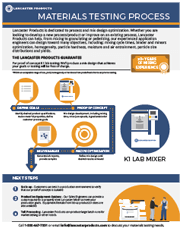 Introducing Lancaster Products High Shear Counter-Current Mixer Recipe Development, the first in a category of posts designed to provide insight into our deep experience in developing thousands of pelletized and granulated formulations over the past 30 years. We develop custom recipes or mix designs for our customers that are rooted in our deep mixing and pelletizing experience. Because every customer’s materials, parameters and processes are different, each requires a unique mix design. In performing proof of concept testing, we have worked with our customers on a wide variety of materials and binder combinations across many different industries. While specific formulations belong to our customers, we have learned a tremendous amount from our experiences with various materials and we wanted to highlight the science that goes into every formulation developed by our materials processing engineers. 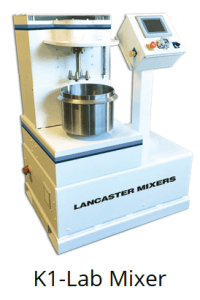 High shear counter-current mixers from Lancaster Products simply employ the most effective mixing technology available. Binders are a key ingredient in agglomerating, granulating and pelletizing applications. Considered an inactive ingredient, Binders are critical in allowing for agglomeration and holding the structure of the pellets together. Many of our customers are pleasantly surprised of how efficiently the Lancaster High Shear Counter Current Mixer can pelletize utilizing low amounts of binders when compared to alternate methods of granulation. The advantage lies in the Lancaster Mixer’s ability to rapidly homogenize tiny amounts of minor ingredients into large amounts of majors. Because the binder is so efficiently dispersed throughout the mix, only the optimal amount of binder is used. 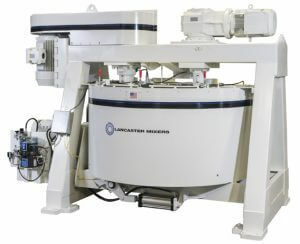 Less effective mixing techniques require more binder than in a Lancaster Mixer, because the binder is not as effectively dispersed throughout the mix. Lancaster Products has introduced design enhancements to the K-Series High Shear Counter Current Mixer line. Through our continuous improvement initiatives our engineers identified various areas of design refinement focused on improving our customer’s maintenance experience, reducing manufacturing time and enhancing the mixer’s overall design. We are featuring our new and enhanced discharge assembly design. Lancaster Product engineers created a simple yet elegant solution to improve the discharge valve design by moving from a keyed assembly to a keyless locking device. The new design is less complex than its predecessor and performs better than the previous discharge style. The new keyless connection enhances performance over the old design and will be easier to maintain and service.